You could say our Seattle – California road trip adventure began at the end of a weekly workday when we set out from north Seattle to head to Portland for the night, but that wouldn’t be totally true. When you head out on a trip, the adventure should begin on the first day but ours had a bit of a stall. Paul had to work for half a day so even though we made it to Portland, he spent the next morning working while the girls and I played in the pool and fitness center. Once he wrapped up work at noon we headed out to make it to Grant’s Pass, Oregon; it’s then that our true adventure began. We arrived in Grant’s Pass that evening, and the next morning we set out with the goal of seeing the Redwood Forest and sleeping in Santa Rosa, CA for the night. My hope was that I’d be able to see some vineyards on the drive to Santa Rosa. Google maps told us it should be a seven hour drive from Grant’s Pass to Santa Rosa, and with an early start we thought we’d be fine. Well, as many who have ever traveled have learned, things don’t always go as planned. The road from Grant’s Pass to the California coast was much windier and slower than we expected. Add in stopping to admire the initial big trees we came upon, and a splash or two at the coast and we found ourselves hitting the Redwood Forest at dusk with night fast approaching. Wow – that’s a big tree! One so small with one so big! Lots of room to run and explore just off the road! The Immortal Tree has survived lightning, forest fires, and logging. If only we could all be that strong! Unexpected stops to enjoy the gorgeous Pacific Ocean! Needless to say, I didn’t get to see any vineyards while driving into Santa Rosa as it was well past dark as we entered wine country. Awaking in Santa Rosa allowed us to use one of our favorite travel tips, asking the locals. We asked our hotel staff if they had a special place to recommend for breakfast, and they did (especially nice since they did have their own restaurant). We were referred to give The Omelette Express a couple of blocks over a try, and we weren’t disappointed. Vacation experiences like eating in a restaurant that is unique, has delicious food, fun and inviting decor, and opportunity for family talks is what makes traveling so fun for our family. From Santa Rosa we headed to San Francisco where we played tourist by visiting the Golden Gate Bridge and driving down Lombard Street. Then we had plans to enjoy a backyard swim and dinner with some of William’s family in San Jose before heading to Coalinga, CA for our overnight stop. 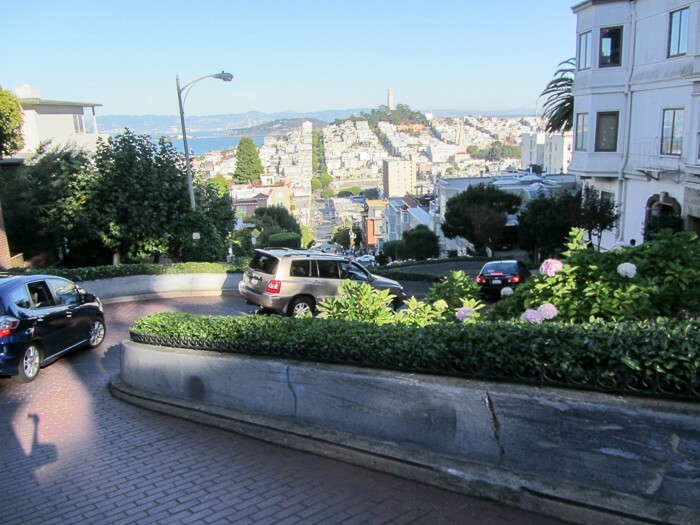 Heading down Lombard Street…along with all the other tourists. Check out these free things to do in San Francisco with kids. For the girls the next morning was one of the highlights of our trip, we headed to Disneyland. We spent four great days celebrating Disneyland Halloween Time and Faith’s 5th birthday before beginning our adventure back home to Seattle. Our return trip included a special visit to some of my family in Camarillo where the girls picked fruit and ate avocados straight from the tree, a delight for them both. Birthday Teacup fun at Disneyland Mad Tea Party! Picking fruit straight from a backyard tree! Yum! Even the flat tire we woke to one morning on our return couldn’t dim or deminish the amazing time our family had on this Seattle – California road trip vacation. Lessons learned were that daylight fades fast when one is exploring, locals sometimes know more than the internet, spontaneous stops can bring some of the best memories, and family time is always good, even when spent at Costco waiting for a tire fix. I’ve heard the redwoods are amazing! Your pictures are awesome and really put into perspective how huge those trees are! It was even amazing to us from Seattle, and we have some big trees up here too! It’s amazing to read some of the stories of what many of those trees have survived! This is a trip I so want to take! So glad you guys had so much fun! Hope you can plan a similar road trip sometime Courtney! I really want to visit redwoods! It’s such a beautiful drive! Also, lots of room for kiddos to run around in the woods! How fun! This looks like a great vacation. I’ve always wanted to see the Red Woods. We went to San Francisco last year, but didn’t make it out there. What a fun family vacation! You’ll have to try and take a return trip sometime Meagan! Really amazing sights and smells! The Redwoods are on my life bucket list! Your photos are so beautiful! You should also check out the Grove of the Patriarchs scenic walk at Mount Rainier National Park! Thanks for the tip Maria — we’ve been wanting to visit Rainier! Looks like I’ll add that to our spring break or summer plans! Thanks Heather! Hope you’re able to see them yourself sometime! I want to go here sometime–big time! And soon! Our family had a great time Anne! Thank you so much for sharing that beautiful trip. I was just wondering when is the best time of the year to do that trip. Thank you in advance for your time. Hi Mary! We traveled at the end of October and it was a great drive. I would avoid the winter season just because there are some sections that will get snow and an area known as “the grapevine” north of LA can be very bad in the winter. I would say that spring to fall would be the ideal times to travel. The redwoods are evergreens, so you won’t experience the beautiful colors of fall, but fall roadtrips are always one of my favorites. If you can go during summer or early fall, you might have some nice weather for beach visits too! We are moving out to LA from NYC in a few months and cannot wait to take a trip to see the California Redwoods. It’s amazing that there are trees that are nearly 1000 years old there – that’s just INSANE! It’s truly awe-inspiring! What a move you’ve got ahead of you. Hope you have safe travels and a fun new adventure!